Japanese Doll Costume includes silky satin dress and tapestry sash. Shown with parasol #9423 sold below. Bite me baby in this 2 piece costume that includes dress and necklace. Light up costume. She'll put a spell on you in this 2 piece costume that includes long sleeve dress with spiderweb sleeves and hat. One part you and one part her is all she needs in this 4 piece costume that includes dress, arm bands, thigh hi's and hat. 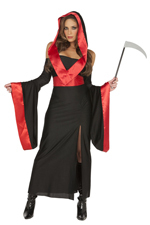 She's to die for in this 4 piece costume that includes off the shoulder dress, hood, waist cincher and scythe.